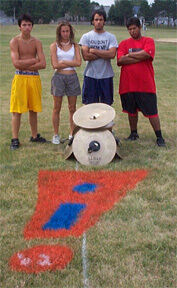 Luke Armstrong contributed this one: "This picture was taken at the Wayland Academy in Beaver Dam, Wis. Pictured is the 2002 Impulse cymbal line (left to right Billy, Carrie, Sergio and Kelvin). "On the ground, chalked out by spray can, is the Impulse logo. It has been a tradition of the lining crew of every year to draw an oversized Impulse logo on the last field that we practice on. "In 1999, the charter year of Impulse, it was chalked in the back right corner of our last field at A. A. Stagg High School. "In 2000, the last year of Mile High Stadium before they tore it down, the crew chalked a small logo in the upper left corner of the field while sections were warming up. "2001, Dunkirk, NY: The largest-known Impulse logo painted on a field done by one mysterious person on the lining crew. So large, in fact, that it could only be seen from the top of the makeshift scaffolding. It stretched from the 15- to the 10-yard line. However, unlike its former logos, it wasn't filled in -- it was just an outline about five inches thick. The letters "YFF" and "FF" were painted in the center of the dot. Those letters are still a mystery to this day. "This leads us to Beaver Dam, Wis., 2002. With a change in the lining crew came a small change in the tradition. The logo was placed where the center X should be. "The tradition, while somewhat strange, was a way of saying "This is OUR field!" It was also a dedication to the people who woke up early to paint the blades of grass, that became our stage." Thanks Luke! Armstrong was Impulse's drum major from 1999, 2000, 2001 and 2002. He will be a member of the Impulse cymbal line in 2003. We've run into a few technical problems recently, so if you haven't seen your Forzato Picture of the day yet, send it to us again and we'll run it as soon as we can. E-mail it to dave@dci.org along with where and when the photo was taken, and send some biographical information about yourself as well. We'll give you full credit. Also, let us know if you want your e-mail address included, to get feedback from other drum corps fans.